While many people have seen the musical Cabaret, few know that it was inspired by a collection of stories called Goodbye to Berlin, written by Christopher Isherwood in the late 1930s. Fewer still have discovered Isherwood’s other writings—novels, criticism, plays, memoirs. The majority of modern readers who are familiar with him laud him as a member of the twentieth century’s gay literary scene: his friends included W. H. Auden, Stephen Spender, and E. M. Forster, and he wrote openly about homosexuality. But to imagine him solely as a literary champion of gay rights is to underestimate his talent as a writer: in all of his books, he sought to depict and understand not only gay people but all people, the vast array of humanity that he saw in the course of his peripatetic, adventure-filled life. From the beginning, Isherwood was both a dreamer and a rebel. He was born in 1904 into a wealthy, landed family in the north of England. Because his father was a Lieutenant-Colonel in the army, the family moved from one garrison town to another, year after year. But this routine-oriented childhood ended, abruptly and traumatically, with the onset of World War I and his father’s death at Ypres in 1915. From that point on, there was little stability in his family life. In 1921, his mother finally settled in London, but at that point Isherwood was already committed to a life of spiritual struggle against the society he had been born into. At Repton School Isherwood met Edward Upward, an imaginative poet who became Isherwood’s closest friend. Together they went to Corpus Christi College at Cambridge, cementing their friendship with their mutual hatred of university life. Gradually this hatred gave rise to a strange fantasy: the “Rats Hostel,” an alternative Cambridge that they peopled with surreal, symbolic figures, many of them taken from medieval legend. Their other world provided Upward and Isherwood with both an escape and a private rebuttal to the complacent privilege of Cambridge. Isherwood was by nature sociable, and he more than Upward mixed with what they called the “Poshocracy”—the many boys who embraced rather than criticized Cambridge’s traditions. But these friendships did not lessen Isherwood’s distaste for student life. In his final examinations, on which his entire degree depended, he deliberately wrote facetious, nonsensical answers to all the questions and was duly expelled. Upon receiving the news, he left Cambridge without a qualm. In the years after his expulsion Isherwood drifted, working in London as a secretary and private tutor. He had begun his first novel while still at Cambridge, and when that was finished he at once started another one. He and Upward had by now transformed their fantasy land into a village called Mortmere, inhabited by a host of macabre characters: many of the stories that they wrote about this mad version of English country life have now been published. In the same period Isherwood met and befriended Auden, who became his friend, lover, and literary collaborator. At last, in 1928, two momentous things happened: Isherwood’s first novel, All the Conspirators, was published, and, in a fit of decisiveness, he entered medical school. The novel met with modest reviews and almost no sales; his resolution to become a doctor lasted six months. In the spring of 1929, giving up on propriety, Isherwood left England and dove into the sexual carnival of Berlin. Isherwood spent nearly a decade in Germany, interspersed with trips into the wider world. He and Auden co-wrote three plays and traveled to China together, witnessing episodes in the Sino-Japanese War that Isherwood later recounted in Journey to a War (1939). He also wrote two novels—Mr. Norris Changes Trains (1935) and Goodbye to Berlin (1939)—chronicling the excesses of interwar Berlin and the rise of Nazism. Confident in his newfound worldliness, he embarked on a memoir about his education in the 1920s called Lions and Shadows (1938), the tone of which suggests that at least fifty years, rather than fifteen, separate him from his younger self. In the introduction to this memoir he instructs his audience to “Read it like a novel.” Thus his interweaving of fiction and autobiography began early, inspired perhaps by Mortmere as well as by his own habit of mentally reshaping the world around him. As the Second World War descended on Europe, Isherwood and Auden fled to New York. Isherwood soon moved on to Los Angeles, where he became involved in Hollywood, as a screenwriter, and in Vedantism, a branch of Hindu philosophy. The former both gave him an income and eventually yielded one of his better known novels, Prater Violet (1945). Vedantism affected him more profoundly, but he couldn’t delve too deeply into its teachings before the war interfered: returning east, he worked first with Quakers in Pennsylvania, helping refugees, and then, when the rising draft age caught up with him, at a monastery, where he retreated as a conscientious objector. His monastic life did not last long, however: quite apart from his unquenchable wanderlust, he did not enjoy celibacy. As soon as the war ended he went back to Los Angeles, where he moved in with an American named Bill Caskey. After a year or two they set off on a tour of South America, which reappeared in Isherwood’s travelogue The Condor and the Cows (1949). There were few interludes in his life that Isherwood did not turn into prose, sooner or later. In 1953 Isherwood finally met the love of his life: an eighteen-year-old painter named Don Bachardy. Since Isherwood was nearly forty-nine, their relationship caused some controversy, but the two men were genuinely in love, and they lived together for the next thirty-three years, until Isherwood’s death in 1986. Often they helped each other in their artistic projects, Isherwood sitting for Bachardy’s portraits and Bachardy typing Isherwood’s novels. 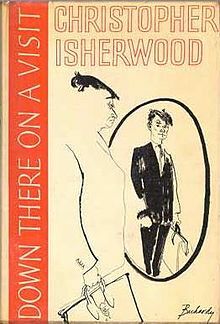 The first manuscript that Bachardy tackled was The World in the Evening (1954), an attempt at an “American” novel that falters, unusually for Isherwood, in both its style, which verges on artificial, and its characters, particularly the heterosexual couple around whom the plot revolves. 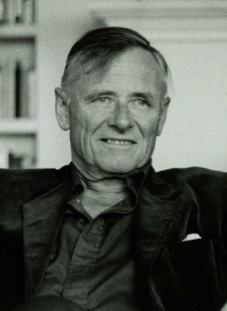 Isherwood was never surefooted when he left the ground of his own life; the contrast between The World in the Evening and his next work shows this trait clearly: in Down There on a Visit (1962), Isherwood returned to his preferred form of memoir-as-fiction, creating a masterful self-study in four interlocking stories about his life in Germany, Greece, England, and America. Many critics consider A Single Man (1964)—a day in the life of a gay professor—to be Isherwood’s masterpiece, but Down There on a Visit is a more substantial and far-reaching work: it paints an insightful picture not only of Isherwood’s own character but also of 1930s Europe and Los Angeles during the war. The novel’s opening section is an almost farcical account of Isherwood’s first visit to Germany, where he stays unwillingly with a tragicomic martinet named Mr. Lancaster. From the first, Isherwood’s approach is arresting: he sinks completely into his twenty-three-year-old mind, eloquently articulating the rage and restlessness of youth, but at the same time he acknowledges the distance between the narrator and his younger avatar. In all four sections, Isherwood adroitly juggles analyses of his own past actions with vivid recreations of his mindset during each episode. Simultaneously, he offers compact portraits of supporting characters: the frustrated, hilarious Mr. Lancaster; Waldemar, an amoral but affectionate German youth; Ambrose, an unhappy, Christ-like figure living on a barren Greek island; and Paul, a troubled man whom Christopher befriends in Los Angeles, convincing him to follow the Vedantic teachings of an eccentric Englishman named Augustus Parr. All of these characters stem from people in Isherwood’s real life: Waldemar’s original was Heinz Neddermayer, Isherwood’s lover in the ’30s, and Paul was based on Bill Caskey. But the portraits are not simply descriptions of living people: despite the limpid prose, which urges the reader to believe that Isherwood dashed off the book without thought, all of the characters are meticulously constructed, not least the character of Christopher himself. It is significant that in this book, as in the earlier Lions and Shadows, Isherwood never states that he is gay. While other characters freely discuss and act on homosexual desires, Christopher himself remains ambiguous, his various loves referred to as “B.” or “G.” with no names or pronouns. His friendship with Waldemar appears to be platonic, and he goes out of his way to establish that when Paul moves in with Christopher, their relationship is physically chaste. While Isherwood emphasizes the depth and emotion of these friendships, the only sexual activity of his own that he describes is an afternoon of experimentation, early on, in which Waldemar’s erstwhile girlfriend is the star performer. Such careful ambiguity may come as a surprise to readers who know Isherwood as a gay writer and who have been lulled into an acceptance of the novel as a tell-all memoir because of the narrator’s seeming candor. Isherwood’s famous sentence in Goodbye to Berlin, “I am a camera with its shutter open, quite passive, recording not thinking,” became, for many, a description of his style, but the implication that he simply wrote down everything he saw, without artifice or interpretation, is highly inaccurate: in Down There on a Visit, as in his other books, Isherwood crafted his scenes with immense care. Yet, despite this cloaked fictionalization, it is impossible to doubt Isherwood’s fundamental honesty. His writing is so witty and yet so frank, so self-deprecating and yet so accomplished, that one rides along on it with a feeling of absolute security. In Down There on a Visit, one knows from the first page that there will be no awkward blunders, no clumsy mischaracterizations. Isherwood knew what he was doing every step of the way, and even the episodic nature of the novel need not give the reader pause: the final, startling explanation of the phrase “Down there on a visit” and Isherwood’s authorial musings on the path of his life ensure that the book feels unified and powerful in its overarching mission: to depict the growth of an observant but isolated individual in a world losing all structure and sanity, as the precarious 1930s slid into the nightmare of the Second World War. Now, at last, I’m ready to write about Mr. Lancaster. For years I have been meaning to, but only rather halfheartedly; I never felt I could quite do him justice. Now I see what my mistake was; I always used to think of him as an isolated character. Taken alone, he is less than himself. To present him entirely, I realize I must show how our meeting was the start of a new chapter in my life, indeed a whole series of chapters. And I must go on to describe some of the characters in this chapters. They are all, with one exception, strangers to Mr. Lancaster. (If he could have known what was to become of Waldemar, he would have cast him forth from the office in horror.) If he could ever have met Ambrose, or Geoffrey, or Maria, or Paul—but no, my imagination fails! And yet, through me, all these people are involved with each other, however much they might have hated to think so. And so they are all going to share the insult of each other’s presence in this book. In the spring of 1928, when I was twenty-three years old, Mr. Lancaster came to London on a business trip and wrote my mother a note suggesting he should call on us. We had neither of us ever met him. All I knew about him was that he managed the office of a British shipping company in a North German harbor city. And that he was the stepson of my maternal grandmother’s brother-in-law; there is probably a simpler way of saying this. Even my mother, who delighted in kinship, had to admit that he wasn’t, strictly speaking, related to us. But she decided it would be nice if we called him “Cousin Alexander,” just to make him feel more at home. I agreed, although I didn’t care a damn what we called him or how he felt about it. As far as I was concerned, everyone over forty belonged, with a mere handful of honorable exceptions, to an alien tribe, hostile by definition but in practice ridiculous rather than formidable. The majority of them I saw as utter grotesques, sententious and gaga, to be regarded with indifference. It was only people of my own age who seemed to me better than half-alive. I was accustomed to say that when we started getting old—a situation which I could theoretically foresee but never quite believe in—I just hoped we would die quickly and without pain. Mr. Lancaster proved to be every bit as grotesque as I had expected. Nevertheless, hard as I tried, I couldn’t be indifferent to him; for, from the moment he arrived, he managed to enrage and humiliate me. (It’s obvious to me now that this was quite unintentional; he must have been desperately shy.) He treated me as though I were still a schoolboy, with a jocular, patronizing air. His worst offense was to address me as “Christophilos”—giving the name an affected classical pronunciation which made it sound even more mockingly insulting. “I’d be delighted to come,” I said, just as nonchalantly as I knew how. I said it because, at that moment, I loathed Mr. Lancaster and therefore couldn’t possibly refuse his challenge. I said it because, at that time, I would have gone anywhere with anyone; I was wild with longing for the whole unvisited world. I said it also because I suspected Mr. Lancaster of bluffing. The reader can chuckle along with the narrator at young Christopher’s posturings as a writer, traveler, and man of the world. But Isherwood never fails in sympathy: he was too well aware of the flaws in human nature to condemn other people’s weaknesses, much less his own. And the most profound motivations behind the younger Christopher’s antics are ones Isherwood never outgrew: his impulse to turn life into fiction, his equal liking and distrust of his fellow beings, and—above all—his longing for the unvisited world, which offered endless material for his ever-busy pen. Learn more about Christopher Isherwood’s novels on Amazon and Goodreads.